First off I want to thank Fred (FTGV) for providing assistance, support and some hardware for this project. Music Hall 25.3 DAC modding. No big news here. Though it is supplied with some good components and sounds pretty good in stock form, it can be made better. It is both professionally and diy modded in various stages. Mods can include 1% resistors, diode bridges swapped out, physically larger caps installed in key locations, better op amps, better op amp coupling and output caps, better tube, tube socket, etc. Being an RoHS product, the solder melts at a higher temp and is more difficult to remove completely with a solder sucker. For me anyway. Initially I went with Mundorf M-Caps for the tube output/op amp coupling caps. Physically larger and high quality Elna Silmic II power supply filter caps were added. 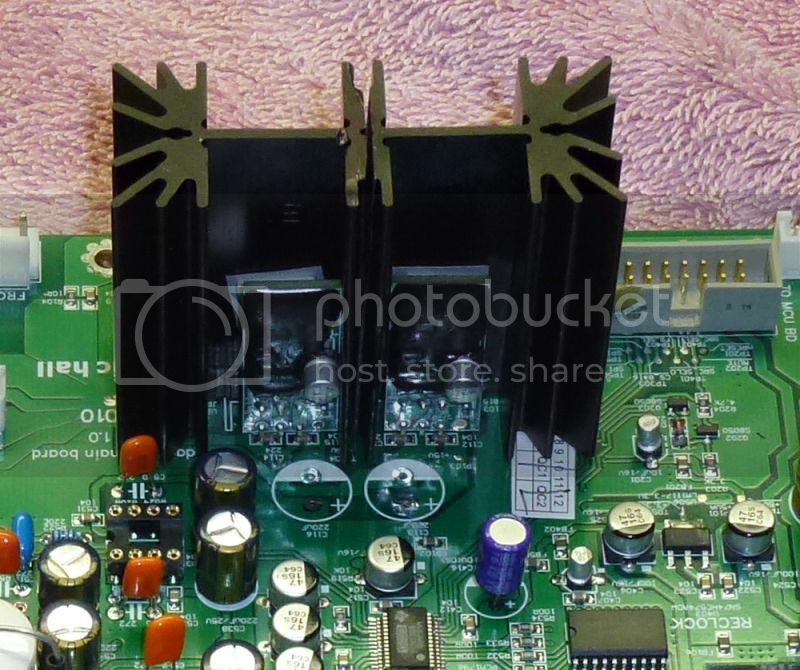 The rectifier bridges for the tube and op amps power supplies were replaced with MUR860's. Instead of a clock upgrade, a higher quality Fox crystal replaced the OEM Utech (Thanks Fred!). I retained the Panasonic FC caps for the op amps. Burson HD op amps and an OEM tube were added with fantastic results. (I tried the LM6172/LM4562 op amps and the Burson HD's won). Both tube and SS out SQ were greatly improved. The majority of folks stop here. I was concerned about both the quality of power and the temp increase on the 7815/7915 op amp power supply regs. The Burson HD op amps add a whopping 700% increase in power required. (57mA (3 x 19mA for the Burson HD?s) versus 7mA (3 x 2.3mA chips). The sink temps for the regs were now in excess of 70C with the cover on. No worries, right? We are still in the operational temp range and we do have thermal shutoff. Well I wanted lower temps and better power regulation. Pro modders have replaced the 7815/7915's with LT1033/1085 adjustable regulators, but I don't think they change the heatsinks. I wanted to see if I could do better. Once again, Fred has been a major help. He has helped steer me to do research on power supplies, helping me sort out my confusion. Why confusion? Well, you got Shunt, battery power, Jung, LT, LM, SuperTeddy, Dexa NewClassD, and Burson regulators to choose from. There isn't much open real estate available inside the case. I did a lot of reading and finally chose the Belleson Superpower regulator (patent pending). It is based on the Jung regulator and is a drop in swap for TO-220 regs. It measures very well against the regs previously mentioned. Amazing line and load regulation, low noise, low drop out voltage, low output impedance and super fast dynamic performance are the claims. I am in the 500mA range for power requirements. Belleson offers a 500mA regulator, but with the Burson HD op maps I wanted to ensure I didn?t max out the reg and went with the 2.0 amp version which will run cooler. I also wanted to address and reduce reg temps. Fred suggested the Wakefield 657 series heat sinks. I waded through 29 pages of heat sinks at Digikey and Fred's suggestion was the best. I went with the Wakefield 657-20ABEP. They are much larger than the OEM sinks and required some fitting. I lopped off most of one side to get them to fit. The cut sinks still have more surface area than the OEM?s. Once I got the sinks to fit, I worked on the mounting. The Wakefield's are not thick enough in the center to drill a hole for the heatsink locating pin. I wasn?t going to drill any holes in the PCB. Instead of epoxy, I scrounged up some old water block mounting hardware, cut and attached it to the bottom of the trimmed Wakefield sinks with 4-40 screws. One hole was drilled in each (press fit) for the locating pin to be soldered in the existing OEM location. The Belleson regs required some adjusting to fit. There was just enough lead to bend in an L shape to clear some SMD bypass caps on the board and protrude just enough out of the bottom of the PCB to solder. It was a great deal of effort but well worth it based on my results. I can touch the sinks now, though they are still very warm. I feel I am now getting the best the Burson HD op amps have to offer. Background seems blacker, bass and dynamics are better, instruments and vocals better defined. So why not just get a Burson DAC? Well I like the tube and SS out options of this DAC, and love the DIY challenge of will it work better, or at all, when I am done. :cheesygrin: Total upgrade cost is $469 which includes a good deal doctorcilantro NOS tube. Total investment so far, including purchase price of DAC is $957. Nice.............What was the improvement in sound over stock? It can be significant, depending on the level of mods. You are not that far away where you can't hear it for yourself. :cheesygrin: I felt the stock DAC was soft on the tube side and lean on the SS out side. This was comparing it to my ModWright Sony 9100ES SACD player with Platinum Signature Truth mods with some fine tubes (high current very low distortion Class A tube output). The mods change the 25.3 DAC. Tube side got firmer, yet retains the tube liquidity. The SS side is firmer now but not sterile. Better soundstage, dynamics, clarity, more refined sounding. Balanced or SS out bypasses the op amp coupling and tube output caps. If I understand it correctly, SS out only goes through the matched pairs of op amps, not the third single op amp. I get this understanding from the upgrades offered by Underwood/Parts Connexion. Their level 2 SS mods only replace the matched pair of op amps, while the level 2 tube mod gets all three. Here is a before pic of the board and a close up of the Burson HD op amps. Very nice job Rich.I bet modding those heat sinks to fit was a pain in the nuggets but I must say from the pic's it looks like thats the way it came from the factory. Thanks Fred! One of the sinks got nicked and I should have stayed in the cold garage with the drill press instead of attempting to chamfer the cooling holes I added in the bottom chassis with a hand drill. It will be apart again to add some parts and I'll dress them with a bit in the drill press. It wasn?t that bad after I removed all the stuff in the way. Then it got easy?.just make it fit! Brian (at Belleson) had an interesting suggestion. Attach the regs to an aluminum strap or plate. The strap should extend into an open area and attach the sinks there. I also found Wakefield makes a sink similar to this. It has more and thinner fins and is thicker where the reg attaches. I may have been able to drill and install the locating pin in that one without making a bracket. The reg terminals are very tight to the SMD bypass cap?s on the board. If I did the typical lean the board out install, the Elna Silmic II filter caps would have needed the leads extended with a funky leaning style of mounting. Brian is great to work with. He answered all my questions and also gave me a plausible explanation for the problem I was having. If the reg was of low tolerance and the thermal limiter was at the edge of engagement, it could affect dynamic current delivery. All in all, the Belleson regs are a step forward. It sounds great when on for 12-14 hours now. Thank you, SCompRacer, for your informative post regarding the Music Hall DAC 25.3 regulator modification. Thus far, I have modified my MH DAC 25.3 with Burson opamps and Mundorf caps. My next stage of mods will likely include a Burson clock and the Belleson regulators you mention in your posts. In this connection, could I trouble you to let me know the exact model number for the Belleson regulators you used? That would help me out, significantly. Thank you. Thanks for the kind words and interest in the mods. Instead of the upgraded clock, I just upgraded the oscillator crystal to save some $$. I installed one Belleson 15V SPL78 2A Positive Output Protected LM78xx and one - 15V SPL79 2A Negative Output Protected LM79xx. You don't have to use the output protected regs. The folks at Burson told me their 250mA power regs didn't have enough output for the op amp circuit in the MH 25.3 DAC. Parts Connexion sells Belleson regs and said I could use the 500mA. I reminded them I have Burson HD op amps and they said "use the 2.0A if it makes you feel better" so I did. If you install as I did, the legs of the reg will get very close to the SMD bypass caps on the board. If you install the regs where they V out, the output filter caps will have to be moved further away. I haven't seen anyone upgrade the power regs, other than Underwood/Parts Connexion upgrade option. They use the LT1033 & 1085 regs. Burson told me this is the first they have seen anyone upgrade the op amp regs. I think they added that last bit of performance that allows the Burson HD's to extract every nuance out of the music. Are you going to install larger sinks or add some heatsink to the existing ones? The new regs will get just as hot as the original ones. Some folks seem to get away with the OEM sinks with no problems. IIRC Belleson told me the 500mA reg may run hotter than the 2.0A regs. Brian over there is extremely helpful if you have any questions. Good listening! Thank you for your reply. I now have the 2.0A Belleson regulators and a Burson clock on the way. For the time being, I do plan on using the OEM heatsinks, unless I run into heating issues. Hopefully the Belleson regulators will be a simple swap with the existing regulators, without too much difficulty. Kewl! Good luck with your install. In the second picture in my first post, you can see two views of the regulators. I had to remove that plastic spacer on the board leads (it just slides off) and carefully bend them for the reg to fit snug against the sink. In another pic, you can see the chip on the negative regulator is slightly tilted. Reason for that is his regs allow for a fourth mounting pin so the negative reg is shifted slightly over the holes in the board. He includes the insulators that go between the reg and sink, no direct mounting. You may have to remove the sink and drill a hole if they don't line up. It is tough to bend them thick leads. I used a pair of long needle nose pliers to bend mine and had to ensure they didn't touch anything. It took some time fitting them! You can do a V type mounting, but the downstream regulator filter caps get in the way. Again, the bent leads on my install are very close to the surface mount bypass caps on the board. As an afterthought, I cut two sections out of a piece of heat shrink and put them between the SMD's and the regulator leads. A little dab of glue holds them in place. You can also extend the leads with some small gauge hookup wire and mount the regs higher on the sink. Well, I finally received the Belleson regulators and the Burson clock and installed them last night, albeit, not without some alterations to the stock heat sinks and having to (slightly) bend the leads on the Belleson regulators. I must also admit that my modifications do not look pretty, but everything works! At least to me, the installation was more difficult and time-consuming than when I installed the Mundorf caps, but it was definitely well worth it. Since I installed both the Burson clock and the Belleson regulators contemporaneously, I'm not able to attribute which was more of an improvement to the sound, but the improvements are very obvious -- wider soundstage and spacing of instruments, right off the bat. Other than a few more caps and resistors, which I think improvements based on those modifications are minimal, at best, I'm done for now. The combination of the modified Music Hall DAC 25.3 along with my Liquid Fire and LCD3 are going to keep me satisfied for some time. Congrats on the install! Yes it is not easy to upgrade the regs but you did not waste your time IMO. The folks at Burson told me that is the first they have seen (other than the pro modders doing the LT1033 & 1085 reg upgrade). The Burson HD's were the biggest bang for me but the Belleson regs gets that added bit of nuance the Burson's are capable of. Glad to hear it went well with no collateral damage. You could always add a chunk of aluminum to the existing sinks if the added temp is a problem. I would have eventually done the clock mod to see if it added anything over the better crystal oscillator I installed, but went with a build to suit DAC project. I just wanted to say I put in an order for some caps and resistors for yet another speaker x-over upgrade. I used Parts Connexion in Canada because of a sale. Put the order in yesterday, received my quote in the afternoon. Paid today and just received confirmation that the order shipped. So a shout out to them for very quick response. I did tell them to send it air mail (USPS) and if they sent it UPS I would refuse it and dispute my PayPal payment. Since Rich was promised it by USPS and it came UPS with no notice and he incurred a broker fee. I had specified Canada Post/USPS handoff cause I've never been slapped wth fees using them. Partsconnexion chose UPS and notified me after it was shipped. FedEx was iffy with fees to Canada, sometimes but not everytime (a couple years ago it was anyway). UPS automatically charges you. And UPS wants that money in two weeks or they charge you interest. But I bet the little fella is feeling neglected now that the new Buffalo kid is in town.
. UPS automatically charges you. Yep Those brown Bush pigs stick it to us as well with product shipped north of the border. Actually the BIII doesn't see as much use due to the open design with sharp corners on the chassis. Jasper the kitty likes to jump up there and check things out. I don't want to contribute to his last jump...:twisted: Still waiting for the Teleporters. Once in place the configuration will be finalized and I'll really make time and listen to it. I worked for them 12 years. Fleet manager, getting groomed for a top slot. The wife gave me a choice, her or the job. I may not have a tidy sum of stock but am healthier than some that have retired from there, wealthy but damaged with messed up kids. Their divorce rate was much higher than the corporate average of the time. I've seen some disturbing things there.